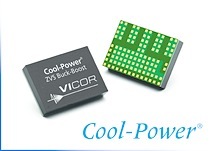 Delivering up to 140 Watts of power, and up to 8 Amps of output current, at up to 96% efficiency, Vicor's new PI3740 Cool-Power regulator features an input operating voltage range of 8 – 60 VDC and a regulated output voltage range of 10 – 50 VDC. Incorporating high frequency zero-voltage switching (ZVS) technology, the PI3740 is targeted for use in automotive, industrial, test automation, LED lighting, and battery charging applications. The PI3740's wide operating voltage ranges can enable a reduction in both the number of regulators and the number of power supply designs that must be designed, configured, manufactured, inventoried and maintained. The PI3740 converter, for example, can be used in a range of applications that would otherwise require the use of several different alternative regulators having narrower operating voltage ranges. For example, a power supply incorporating a PI3740 can be designed to operate from, or charge, both a 12V and a 24V battery source. All Vicor PI37xx Buck-Boost converters are capable of transitioning between Buck mode (input voltage is greater than output voltage) and Boost mode (input voltage is less than output voltage) for applications in which the regulator input voltage varies above and below the output voltage. The PI3740 integrates its controller, power switches and support circuitry within a high density, 10mm x 14mm x 2.5mm SiP (System-in-Package). Other PI3740 features include: high frequency (1 MHz) operation; parallel options; constant-voltage and constant-current (e.g. for LED lighting applications) operating modes; over-voltage, over-temperature and over-current protection; -40º to 115ºC temperature range; and an integrated current sense amplifier and integrated general purpose amplifier.